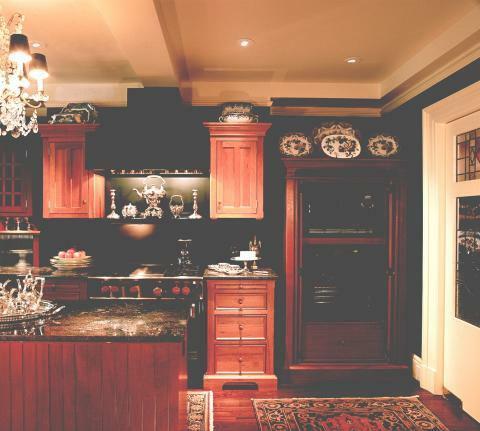 These unfitted Pie Safe / Pantries that conceal ovens are often combined with island cooktop workstations, hiding the ovens that are usually much more visible than the flat cooktops. 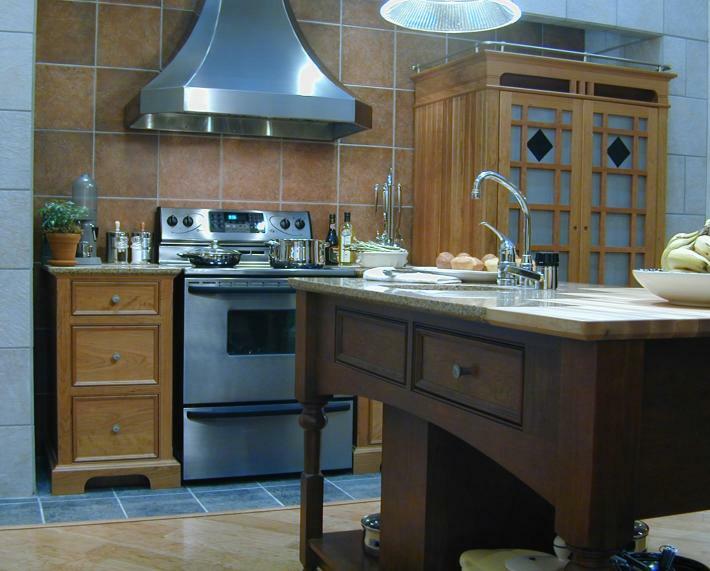 A DO40-OM (Hides an Oven and Microwave) in Natural Cherry, 41 1/2″ W x 29″ D x 75″ H is shown above in the 2001 KBIS Womans’ Day SIP exhibit. 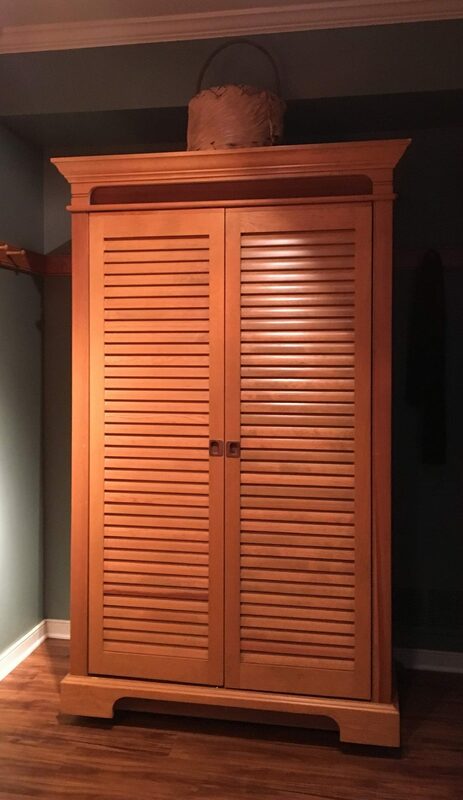 This Old English Pine DO40-OO Pie safe conceals two 30 inch wide ovens behind its louvered doors. The DO40 units are versatile accent workstations that perform many functions in today’s kitchen. The models shown here can conceal a double 240V/40A oven or a single 240V oven and a 120V microwave oven or just a single microwave or oven. YesterTec’s modern day Pie safe is also available as a full height pantry with six adjustable height pull out trays and a baking sheet flip-top storage compartment. This DO40-OM allows this large kitchen to have 3 ovens. Because its height is lower than all the other tall units, a DO40 Pie Safe can be placed beside a taller unit to create a more interesting composition. 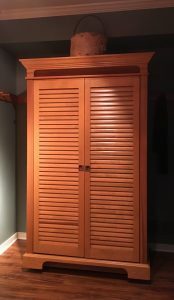 This lower height also makes it ideal to be used as a room divider, and backs are available for this purpose (see below). 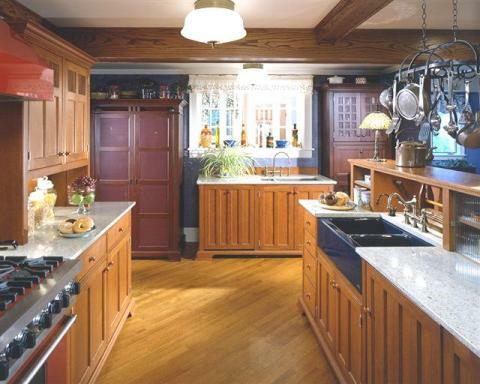 This kitchen includes a freestanding DO40-OM with its 4 panel doors. Any DO40 Pie Safe that conceals ovens includes YesterTec’s U.L. Listed technology that only allows the ovens to operate when the flipper doors are open and stored in their pockets. This unfitted DO40-EC Entertainment Center can conceal up to a 30″ Flat Screen TV (with pocket door model), stereo equipment, video and CD storage. Only woofers and speakers need to go else where. (unless small speakers are used). 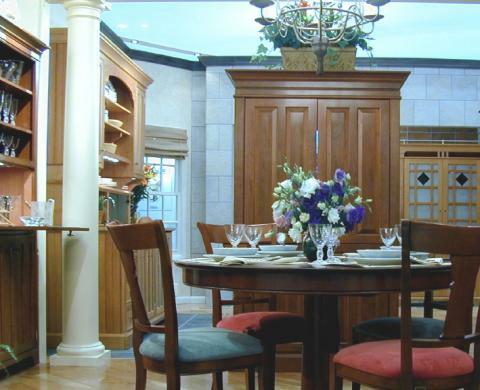 Here, the Entertainment Center was used as a room divider between the kitchen and the dining area.